What could be healthier than combining all-night LAN partying with grilling burgers, all without leaving your comfy chair? Everything, probably, but don't let that stop you, boss. 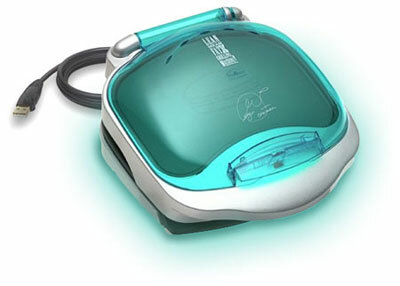 Called the George Foreman USB iGrill, this grill uses USB 2.0 to give your cooking an interactive experience. You can download recipes from the Internet then set up the iGrill to handle things like how heavy the meat is and how soft you want it to be. The iGrill can be found online for around $100. I, for one, welcome the impeding cholesterol crisis that's about to be experienced by computer-holics 'round the country. UPDATE The iGrill isn't real so stop with the hateful e-mails. Between the readers and rival bloggers teasing me about "falling for it" (omglol! !1), I think I get the point. Obrigado.